The habits of other families can be fascinating, but generally speaking, whatever works for a particular family is fine. It doesn't matter what the rest of the world thinks. Sometimes, of course, family habits lead to dysfunction. Estranged families are really sad. But the enmeshed families on the other end of the spectrum prove that families really can be too close. 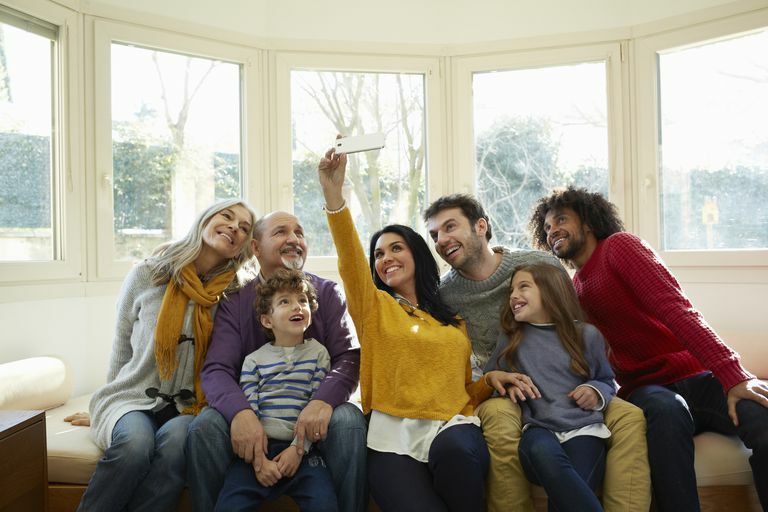 Many studies have shown that family cohesion reduces stress from outside sources. It has even been demonstrated to speed healing from physical setbacks. Hispanic families, for example, are traditionally close, and that closeness may contribute to the longer life spans that Hispanic Americans enjoy. But most of us have considerable variations within our families, and problems may occur when families don't recognize those members that want to be slightly removed from the family action. The more-sociable family members insist on frequent contact, pout when they don't get phone calls and insert themselves into occasions without invitation—all to the dismay of the more-private family members. For most families, the goal is to be in touch without being demanding or intrusive. Electronic communications have made this goal much easier to reach. Grandparents can send a child a text message, tag a grandchild in a Facebook post or tweet, or find out whether a grandchild has posted anything in Instagram, all without demanding any attention. Of course, electronic communications are no substitute for face-to-face contact and phone time. There are times when you just want to hear a family member's voice and you should just pick up the phone. Or Skype or FaceTime and you can see the faces of loved ones, too. If there is such a thing as being too close, it takes place in what psychologists sometimes call "enmeshed" families. In such families, family relationships have displaced other normal relationships. Those in enmeshed families are expected to look inside the family for satisfaction and support rather than turning to the larger world. This habit may stunt their growth as individuals. In an enmeshed family, for example, a decision by a family member to take a job in a distant city can cause great consternation. The feeling is that the family is being betrayed and abandoned. In a healthy family, this decision may cause pain, but it's not seen as a betrayal of family. In an enmeshed family, members are made to feel guilty if they don't visit enough, or call enough, or if they miss family events. In a healthy family, such members may be the recipients of some complaints or some teasing, but they are not made to feel guilty. Have you ever heard someone complain about the "drama" in his or her family? Chances are that the family fits the profile of the enmeshed family, in which each family member feels obliged to react to whatever is going on in the lives of other family members, effectively multiplying the tension. Another type of dysfunctional behavior that is observed in enmeshed families is that alliances within the family are constantly being formed, broken, and re-formed, mostly because family members are expected to choose sides on every issue. Keeping up with who is on whose side causes much stress in the family. Here are some examples of behavior that occur in enmeshed families. Anne flew home early from a Caribbean vacation to attend the funeral of a great-aunt. Her family is large, and she wasn't especially close to this aunt, but it would have been a breach of family etiquette not to be there. George meets a young woman of a different faith and considers converting. His parents are horrified at the idea that he would give up the religion of his family. When her adult children are going to be on the road, Marie checks traffic and road conditions and calls them to give them advice about routes and frequent updates. John is looking for a good used car. He is expected to buy it from his cousin's car lot, even though he doesn't trust his cousin's automotive expertise. Melissa has a new baby. Her mother stops by every day, supposedly to lend a hand, but she mostly spends a couple of hours talking and playing with the baby. Joan is at her mom's house. She notices that her mom has extra staples in her pantry, so she helps herself. Ralph has the chance for job advancement, but it will mean increased travel and missing family gatherings. He dreads broaching the subject with his parents because he knows they will make him feel guilty. These scenarios aren't terribly far removed from normal behavior. What makes them abnormal is the force of the outrage when family expectations are flouted and the routine disregard for boundaries. What Does This Mean for Grandparents? Grandparents have a vested interest in keeping families close because they want to see their grandchildren. And while grandchildren bring great joy into their grandparents' lives, grandparents bring some very specific benefits to their grandchildren as well. It's a win-win. Be sensitive to the preferences of family members but maintain a reasonable level of contact with them. Be concerned about problems within the family but do not feel obligated to weigh in on all of them. Support the careers and other choices of your children, even if it means you will become a long-distance grandparent. Grandparents do have a bit of a special problem, however. Their desire to stay close to family members may occasionally lead to their overstepping boundaries. Grandparents are parents, but we are not the parents of our grandchildren. Some of us have trouble making the distinction. When your children are new parents, for example, don't assume that there is an open door policy. In fact, grandparents should avoid unannounced visits for a myriad of reasons. The possibility for conflicts doesn't go away when the grandkids get older. When it comes to school and extra-curricular events, grandparents have a fine line to walk. They should be welcome at games and public performances, but they shouldn't assume that they are welcome at practices, rehearsals, parents' night, or teacher conferences. Grandparents must be especially careful not to monopolize the social calendars of adult children, who need free time, time to spend with partners, and time to socialize with peers. They also need some unscheduled weekends for spontaneous activities. Above all, stay out of any marital conflicts that your children may be having. Don't pry, and offer advice only if asked. Interfere only if a family member's safety is threatened. It's generally a bad idea to judge your family by comparing it to other families. Plenty of families seem happy and harmonious but have hidden issues. Judge your family only by how it works for you and for other family members. If you usually feel loved and supported, let minor irritations go. Love and support your family members in turn, but try not to limit their choices. Can Broken Family Relationships Be Mended?